Author: Fleming, Candace Set In . . . 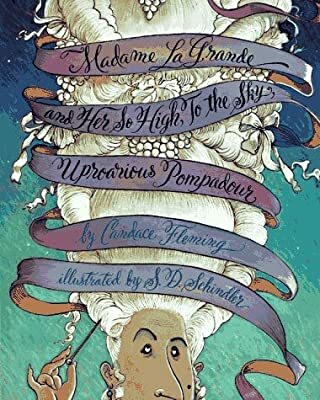 Description: Pompadours have become the rage in Paris, and Madame LaGrande wants to get one in time for the upcoming opera season. But since neither she nor her stylist know when to say "Enough! ", her outrageous coif winds up housing two pigeons, three cats, four dogs, and the King--all without Madame L. knowing it! In the grand tradition of The Emperor's New Clothes, this uproarious story of exaggerated vanity will have kids laughing so hard it will curl their hair!